A revised and updated look at the continuing editorial controversies surrounding Joyce's masterpiece. James Joyces Ulysses, arguably the greatest novel of the twentieth century, has been the subject of scandal from first publication in 1922. Initially denounced as obscene, subsequently banned in Britain and the US, it never failed to arouse controversy. There have been arguments about what constitutes the correct text. Copyright wars have engulfed the book in recent years. Whatever trials beset it, Ulysses continues to fascinate scholars, reviewers and admirers of great literature. When Bruce Arnolds The Scandal of Ulysses first appeared, twelve years ago, it was described as the sensational life of a twentieth-century masterpiece and the definitive biography. In 1992, with the ending of copyright, the sensational, scandalous part of the life of Ulysses seemed to be drawing to a close. This was far from the truth. A new phase was about to open with the change in the law on copyright. And the book, in the mid-1990s, was plunged once more into conflict with the James Joyce Estate going to the courts to protect its rights. This revised edition brings the story up to date. It describes the sad fate of John Kidd, once the knight in shining armour challenging the Joyce establishment, now discredited in Boston, without his James Joyce Center and with no edition of Ulysses to offer; the resurrection of Hans Walter Gabler, whose reputation was assaulted by Kidd and seemed irrevocably damaged, but was then recovered and made whole again; the battle between Danis Rose and the James Joyce Estate over yet another edition of the book, ending up in the most famous copyright court case of the 1990s; and how a new army of Joyceans took the place of the old. 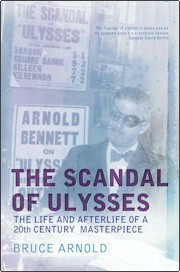 This expanded and updated edition of The Scandal of Ulysses is a masterful work of literary detection. Publication coincides with the centenary of Bloomsday. Ch. 10 "Is No One Awake at the Wheel"
Ch. 12 "What Sort of a Kip is This"